Prominent & Leading Manufacturer from Coimbatore, we offer cnc oil mist collector and oil mist collector. large amount of oil mist fume containing toxic harmful is come out. It is a serious threat and danger to workers health and factory Atmosphere. 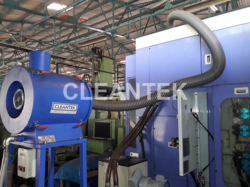 CLEANTEK Manufacturing fume oil mist extractor in different capacities and models. For more details Please contact us.